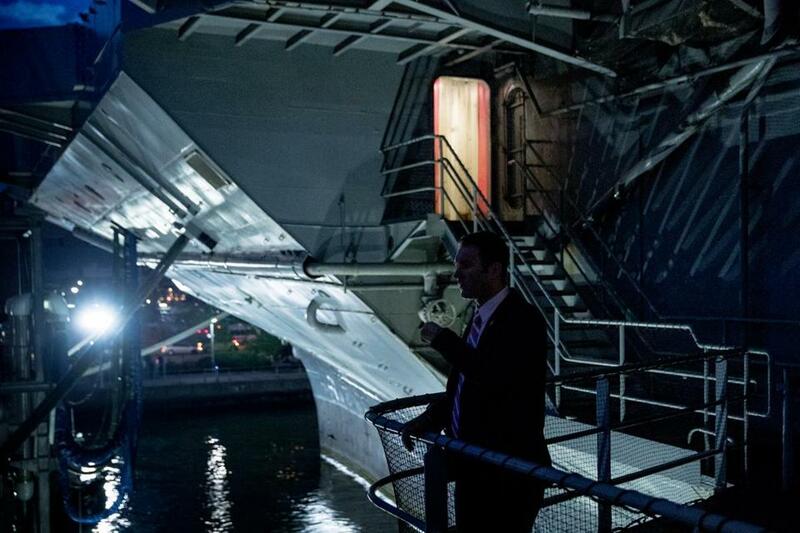 A Secret Service member stands on board the decommissioned aircraft carrier Intrepid as Democratic presidential candidate Hillary Clinton arrives to appear on the “Commander-In-Chief Forum’’ on Wednesday. On Wednesday evening in New York, at the invitation of NBC News, I attended the grandly-styled “Commander-in-Chief Forum.” The event, which occurred aboard the decommissioned aircraft carrier USS Intrepid, was profoundly disheartening. On air and off, NBC personnel repeatedly characterized the forum as “historic.” It was, in fact, banal and will have been deservedly forgotten by the time this article is published. Yet in a perverse way, witnessing the event was an illuminating experience, offering a close-up view of the media’s role in trivializing American politics. 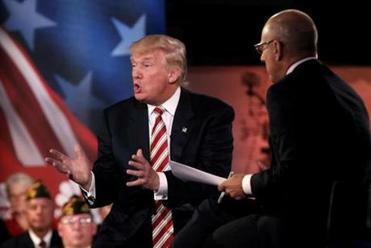 For those who wisely kept their televisions tuned to another channel, the forum consisted of two 25 minute interviews with Hillary Clinton and Donald Trump, who appeared separately but in succession. Matt Lauer moderated, his own questions alternating with those posed by a live audience of veterans. Lauer led off by challenging Clinton to explain her use of a private email server while serving as secretary of state. She offered her usual scripted reply. A member of audience then followed by raising precisely the same issue. Clinton wearily repeated herself. Overall, the exchange consumed roughly one-third of Clinton’s allotted time. We learned nothing, thereby setting the tone of the evening as a whole. Co-sponsoring the event with NBC was an organization called Iraq and Afghanistan Veterans of America, with its president Paul Rieckhoff allotted a prominent role in the evening’s proceedings. Questions posed by IAVA members tended to focus narrowly on the needs — one might even say the grievances — of young veterans. Perhaps this was to be expected. Just as dairy farmers want to know what a prospective president will do to support the price of milk, veterans want to know what a president will do to deliver on matters effecting them directly. Yet it was as if they were auditioning someone to head the VA.
His views on Iraq’s oil and Vladimir Putin show once again he is unfit to be president. This line of interrogation did elicit from Clinton an improbable vow to “hold weekly meetings in the Oval Office” to discuss veterans’ issues. As a means of assessing the candidates’ ability to set basic national security priorities or make sensitive decisions related to war and peace, however, it was largely irrelevant. When attention did turn to national security issues, the results were less than edifying. Clinton demonstrated a seasoned pol’s skill at evasion, skipping past uncomfortable realities awaiting the next president. She defended her role in promoting US intervention in Libya’s civil war by saying “we were able to save lives,” dodging the fact that Libya has since become a failed state and ISIS sanctuary. She promised to defeat ISIS without saying how. She offered assurances that as president she will never, ever send US ground troops to Iraq, overlooking the fact that several thousand American soldiers in that country are today engaged, directly and indirectly, in combat operations. As for Trump, he was Trump. To defeat ISIS, he has a secret plan. If the plan derives from a coherent worldview, that too remains a deeply guarded secret. Trump does, however, have opinions, which he offered with characteristic certitude. The VA is tantamount to a “corrupt enterprise,” he remarked. The key to success in Iraq has always been simply to “take the oil” and be done with it. Under Obama, American generals have been “reduced to rubble” – although the eighty-eight generals and admirals endorsing his own candidacy offer proof positive of his qualifications to serve as commander-in-chief. Trump’s responses highlighted the faith-based nature of his candidacy. Either you believe Trump’s claim that he and only he can “make America great again,” or you don’t. And if you don’t, the very fact that he is in the race becomes absurd. After the forum itself concluded came televised commentary and analysis. I played the role of potted plant on Rachel Maddow’s show, also held onboard the Intrepid. More claims of the “historic” nature of the enterprise were heard, but the overall tone shifted. It now became smug, self-congratulatory, and narcissistic. Vets who during the previous hour had asked the candidates questions were now invited to critique the answers, which they found unsatisfactory. Given the overarching mood of deference toward veterans, critiquing their questions was off-limits. In one unintentionally amusing segment, military surrogates — for Clinton a retired Air Force brigadier general, for Trump a former army three-star — were trotted out to explain what their candidate had really meant to say during the previous hour. After the generals had mumbled their explanations, Rieckhoff, now elevated to the status of co-host and clearly riding high, triggered a carefully laid ambush. No one cares what generals have to say, he declared. If you want to know about war, talk to sergeants. Those in attendance applauded. Rieckhoff preened. As Maddow cut to a commercial break, the befuddled generals slunk off the set, looking considerably the worse for wear. All of this unfolded in an environment that displayed the remarkable technological agility of a modern news operations. The hangar deck where we sat and the flight deck above accommodated multiple temporary sets. Lights, cables, and cameras were everywhere — not to mention the brightly-lit NBC logo. Video excerpts from the forum itself were seamlessly integrated into follow-on programing. With split second timing, one host handed off to another. On camera, no one broke a sweat. Off camera, activity was intense but purposeful. Perhaps the results were entertaining — I’ll leave that for others to judge. But this I know for sure: It was not journalism. It did not inform. And if NBC’s forum offers a preview of the upcoming presidential debates, then we’re in trouble. Granted, journalists can’t force politicians to provide intelligent answers. But they can at least pose intelligent questions. On that score, NBC flunked. • What lessons have you drawn from America’s post-9/11 wars and how would those lessons affect your approach to policy? • Defeating ISIS is an imperative. Then what? What is your strategy for addressing the larger phenomenon of violent radical Islamism? • Explain the Syrian civil war and describe the US interests at stake there. • Compare the costs and benefits of employing missile-firing drones as instruments of assassination. • China has emerged as a power of the first rank. To what degree do Chinese aspirations collide with US interests? What will your administration do to protect those interests? • A growing gap exists between the one percent of Americans who serve in the military and the 99 percent who don’t. Is this as a problem? How will you remedy it? • The United States is embarking upon a trillion dollar effort to modernize its nuclear strike force. What is your view of this program? How does it square with promises by presidents from both parties to seek a nuclear weapons-free world? • Where does climate change fit in your hierarchy of national security priorities? • What are the limits on the president’s war making authority? Describe the role Congress should play in deciding when and where US forces fight. How might Hillary Clinton and Donald Trump have handled such questions? We don’t know because they weren’t even asked. And that’s a problem.